Train oral motor. Develop logical skills. Take out the magic wand. Press the button with the finger to light up the star. Continue pressing the button to let the star grow and light up the 6 candles on the birthday cake. This trains fine muscles as well as eye-hand coordination. When all the candles light up, there will be the birthday song. This trains cause and consequence. 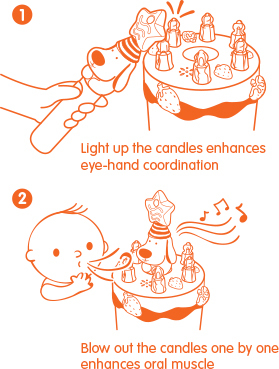 With their mouth, child blows out the candles one by one. This is oral muscle training. Then comes the clapping sound, another example of cause and consequence.